Very tuff bag, ordered them for our grand opening to hand out to customers about 4 months ago. We still use them personally and I see them around town from time to time. Just placed another order for the bag to hand out at an upcoming food festival we are part of. Very stylish way to promote eco-friendly living. Reusable bags are the future of shopping. we need to ban the cheap, irr-responsible, hazardous to the environment, 1-time use thin plastic bag. I have used this company at work before and always had great experiences. I had the idea to use them for my wedding as a gift bag, we created a custom graphic to print on the bag and it came out fabulous. Now all of our friends and family can reuse these bags and have the memory of our special day wherever they take them. 2.) its great that you guys care about the environment and do not use those plastic shopping bags. 3.) I saw your bags around town, they stood out from your normal shopping bag. I figured I would come check out your store even if I only get a reusable bag from you it was worth the trip. Sophisticated looking bag for a very affordable price. We handed them out to promote our casino. We chose the laminated finish for our bag order. We like the flare it added to our bags. The lamination gave our bags an edge that the competition did not have. Great options available when customizing these bags. We were impressed with the quality and pricing. It was nice to know that when I had a question concerning my order I could call speak to an actual person on the other line. Blown away! This bag makes it possible to be eco-friendly while still being stylish. My customers can't stop raving about them! These eco-friendly bags have been instrumental in creating a buzz. The exposure we have gained is pretty amazing. Just received our order for 7,000 bags. The color scheme is spot on. Custom Earth Promos met all our expectations from the beginning of the order process until the end. Extremely impressed with these bags! The metallic lamination catches the eye of everyone providing maximum exposure for my brand. Absolutely thrilled with these bags! Sophisticated yet strong! The feel of this bag is out of this world! Super smooth yet still strong and sturdy. The sophisticated look of these bags is perfect for my salon! Couldn't be happier! Really impressed with the way my bags turned out. The logo looks great! These bags are the best addition to out marketing campaign! Really attention grabbing and attractive! We went with the metallic gold pattern for my jewelry store. I would recommend this bag to anyone! We prefer the non woven polypropylene material. The PET material is a great material as well, I just prefer the softer feel of the polypropylene. I like the way our logo prints on it as well. Great product at even better prices!!! Really great eco-friendly bags that exemplify perfection. Thanks for all the hard work and attentiveness with our order. I like the pattern on this bag, this is why we ordered it. My clients love them and use them for everything. This in return gets me advertising and eyes on my logo. I recommend going with this model the RB13. Recycled reusable bags are the wave of the future. We use custom earth promos for all of our reusable bags. I would recommend using them. My organization is a big supporter of the green movement. We support the use of recycled reusable bags at all of our branches. Custom earth promos is a good company to partner with on your recyclable reusable bag order. They make a quality product that will tell customers you care about the environment. Going with them is a win-win situation for you and your customers. I highly advocate the use of recycled reusable bags from custom earth promos. Out of all my research on the net, this company has the most professional website. i called them and got the care to my order that I required, I ordered thousands of bags and was nervous about the finished product because we did a custom graphic. When my bags came they were great no complaints, the prospective customers loved them and I have used custom earth 3 times since then. 5 star rating. I love reusable recycled bags. Its the easiest way to participate in the saving of this planet. Custom earth promos makes the ordering, designing process very easy. Received our reusable bags today. The print looks great. Stitching seems to be done well. We are very satisfied with this product. What’s the quickest way to grab attention with your eco-friendly marketing campaign? With our metallic gloss designer grocery bag! Pairing an eco-friendly message with a polished style is sure to impress your customers, who will proudly flaunt your bag wherever they go. There are so many benefits to using Custom Earth Promos’ Wholesale Reusable Green Bags to spread brand awareness. Presenting a stylish, sophisticated, eco-friendly bag is a truly shrewd marketing move. Because you’re demonstrating your company’s commitment to being eco-conscious, and you’re doing it with style—and that can bring your business a lot of positive publicity. The Wholesale Reusable Green Bag makes for a stylish trip to the supermarket, with its glistening metallic finish sure to draw plenty of eyes to your brand name. If you’re looking for a green tote with the high-fashion feel, try a shade of silver or gold to capture the spotlight. 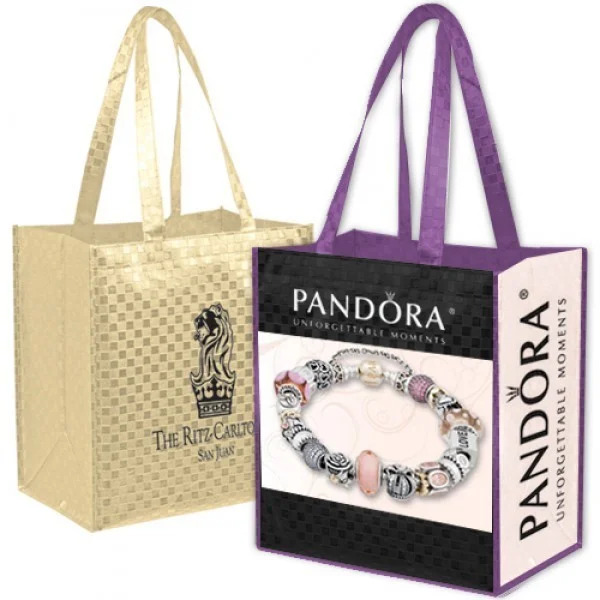 Available in these two stylish colors, our metallic designer grocery bag is sure to glam up any marketing strategy. When you choose eco-friendly bags from Custom Earth Promos, you can leave the quality control to us, so you can focus on your business. 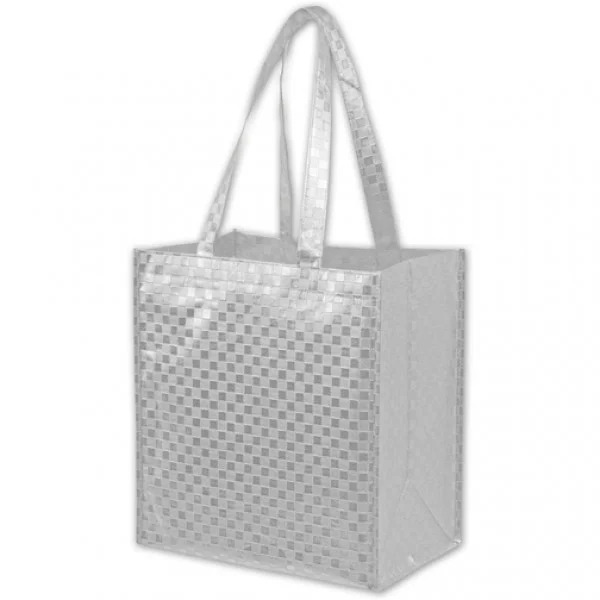 Our metallic lamination process adds sturdiness to the bag, so more items can be carried more easily. With its shiny finish and attractive metallic hues, the Wholesale Reusable Green Bag is one of our most stylish green offerings. A recycled plastic bottom board insert gives the bag a firm structure and additional strength. And glossy metallic hues pull greater focus toward your logo imprinted on the bag. So your brand becomes even more dominant and recognizable. Made from high-quality 100 GSM recycled materials, featuring 8-inch gussets and 22-inch handles, our bags are durable and resilient, giving your customers great service that lasts. We use careful production methods to ensure that our products are safe to handle, environmentally friendly and ideal for your marketing needs! 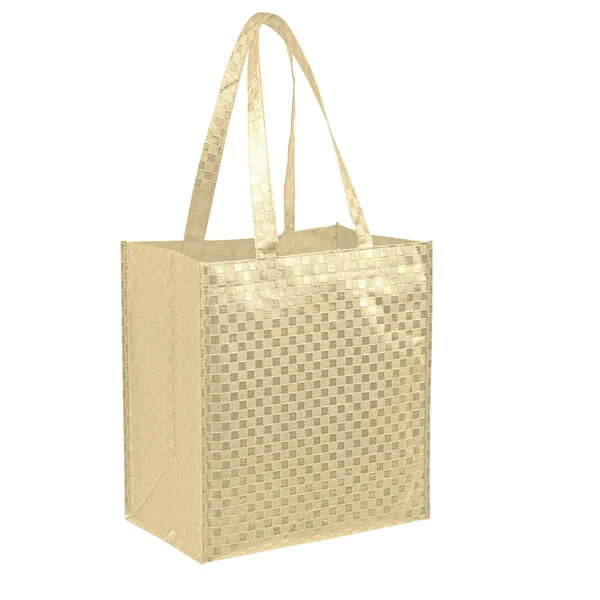 Available in spectacular silver and gold patterns, you’ll barely want to customize our lightweight Wholesale Reusable Green Bags! By investing in this powerful, cost-effective advertising tool, you can be assured of top quality, durability and style. And you can print your logo on them, as large as 8" W x 8" H, so there’s no question that your company brand is clearly visible. Offering a great range of printing options in black, this sleek bag offers an unparalleled marketing value. We’ll even throw in a free 1-color-on-1-location imprint to prove how effective our eco-friendly metallic designer bags can be at generating buzz! A custom trim and handle also comes standard for custom overseas options. This feature will set your bag apart by adding stylish accents to an already sharp design.